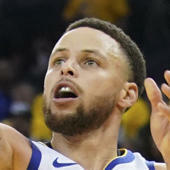 Curry supplied 25 points (9-25 FG, 6-18 3Pt, 1-1 FT), eight assists, seven rebounds, three steals, and one block in 37 minutes during Monday's 111-105 loss to the Spurs. Curry was inefficient as a scorer but produced a very well-rounded stat line. With the Warriors and Nuggets sporting identical 47-22 records, Curry and company will likely try to lock in across the final 13 games of the regular season in order to secure the top seed in the Western Conference.